Avoid the new model waiting list! One of the best known Rolex watches since it originated in the 1950’s. Originally made by Rolex in partnership with Pan Am the GMT Master was designed for pilots. It’s dual time functionality and bi colour bezel made it easy to determine which time zone they were flying in. The GMT Master is still made today showing how after 60 years this model is still in demand. This example is one for a collector or someone that wants just the best totally original unpolished example they can find. Affectionately known as the “stick dial” due to the design of the lettering on the dial after the words GMT Master this is very rare. These were produced by Rolex around 2007 and were the last of the classic models before the ceramic bezel 116710 was introduced. The stick dial was available with either a 3185 or 3186 movement, this example has the 3185 movement. This mint classic GMT Master 11 ref 16710 was made in 2007 and has a Z serial number. It is a UK watch supplied by the authorised dealer in Leamington Spa. It comes complete with it’s inner and outer box, chronometer certificate, instruction manual and both tags. Due this being totally original and likely to be bought by a collector we have decided not to refurbish it so the buyer can see it in it’s original condition which even has the original sticker on the case back. The bracelet and case are in fantastic condition and only showing the lightest of micro scratches from very very light use. For those that prefer the Pepsi (Blue and Red) look or “all black” look the bezel insert can easily be changed. Would suit a lady or a gentleman wanting something classic, sporty and elegant. 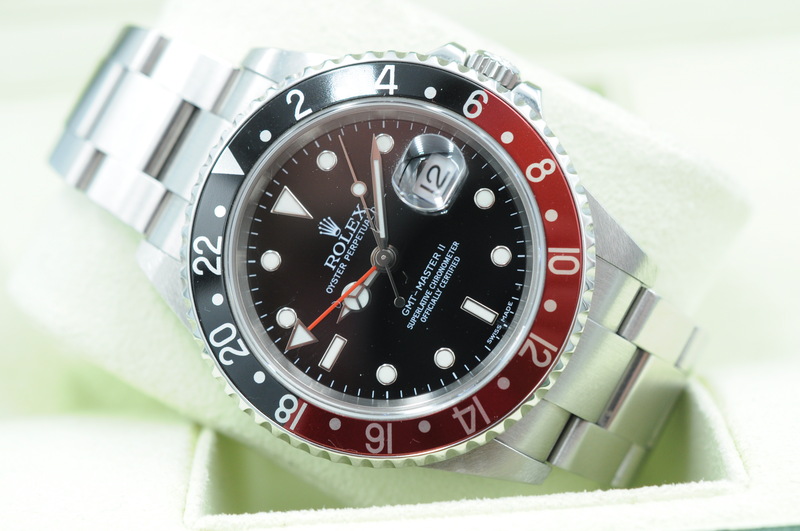 The GMT Master is very rare these days and prices are on the rise. This is a collectible watch and will be a great investment which can be stored in a safe or even better enjoyed every day!